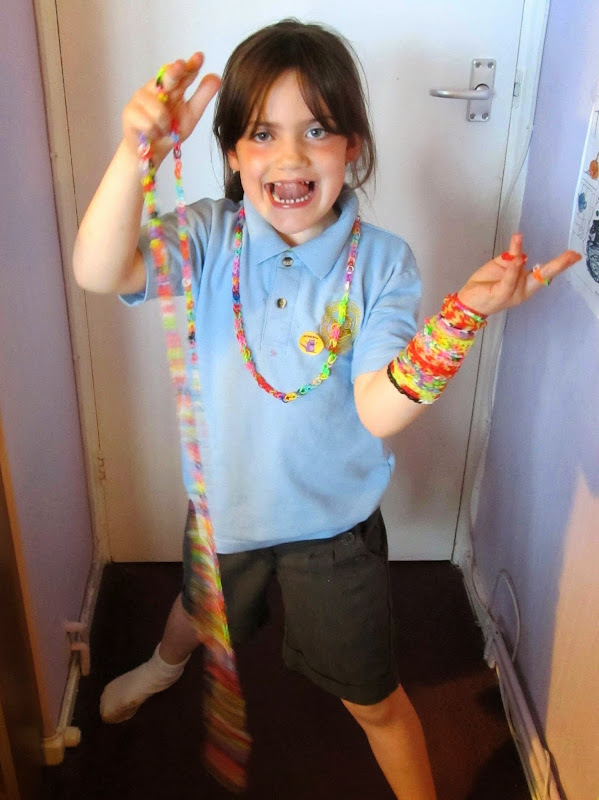 I'm not saying Amelie's obsessed, but the long chain she's holding contains four hundred bands (trust me, I've counted them) and she made the whole thing, from scratch, yesterday evening. I've never seen anyone work so hard. It's like having a Japanese prisoner of war on the sofa. And what's more, she made it all on her fingers, so not only did she have to eat her tea with one hand, but she had to trail the entire chain behind her when she went to the bathroom. I've no idea how she got her shorts down. On the plus side, it's keeping her remarkably quiet, so at 99p for a pack of 300 bands, this is definitely money well spent. Although with a burn rate of 400 a day, it's costing me a tenner a week. To be honest though, anything which stops her bothering me at the moment is a godsend. Inexplicably (to my impatient mind), I still feel as rough as sandpaper, and the cyclizine hasn't done a huge amount for my sickness, although this is the last day of the steroids, so I'm hoping that will improve. Currently, however, my tolerance threshold for demanding children is at a fairly low ebb, so I'm all in favour of Amelie amusing herself. Lisa: I've just had a text message to say that Beavers is cancelled. Me: Dam! You should lodge a complaint. Me: What do you call a beaver's home? Lisa: Is it a den? It's no wonder I feel ill.